To Cite: Mamalyga M L, Lobacheva G V, Alshibaya M M. Recovery of Respiratory Function After Coronary Artery Bypass Graft Surgery Using Pep-Therapy, Multidiscip Cardio Annal. 2019 ; 10(1):e82822. doi: 10.5812/mca.82822. Background: Bronchopulmonary complications after CABG remain one of the main reasons for the increase in hospital mortality. A number of works showed the effectiveness of using PEEP-therapy and oPEEP-therapy in pulmonary pathology. However there was no direct comparison of the effectiveness of these methodic approaches in cardiac surgery patients. Objective: Due to this, the study objective was to study the effectiveness of recovery of respiratory parameters after coronary artery bypass graft using different device methods: PEEP-therapy and vibration PEEP-therapy. Methods: We studied 45 patients who underwent CABG. Patients were divided into 3 groups: Group I (control) - incentive spirometry was not performed after surgery, group II - PEEP-therapy was performed with EzPAP (USA), group III - oPEEP-therapy was performed with Acapella device (USA). Spirometry test was performed using device SMP-2101-RD (Russia). Results: Studies showed, that on the second day post-surgery in groups I, II and III vital capacity decreases by 42%, 35%, 34% (P < 0.01), and forced vital capacity - by 46%, 32%, 35% (P < 0.01) respectively. In patients of all studied groups there is detected statistically significant decrease of PFER, AFER 25 - 75, MFER 25, MFER 50, MFER 75. On day five after surgery in the patients of second group vital capacity and forced vital capacity reached pre-surgery level, while in the group I these parameters decreased by 31% and 34%, and in group III - by 25% and 26% respectively. On the ninth day after surgery vital capacity and forced vital capacity in groups II and III reached pre-surgery level, while in group I these values remained decreased by 28%, 32%, respectively. Conclusions: Carrying out PEEP therapy after coronary artery bypass surgery with EzPAP incentive spirometer allows the restoration of volumetric and velocity respiratory values at the moment of patient discharge from the hospital, whereas after vibrational PEEP therapy the Acapella device restores only volumetric values, and in the patients of the control group, recovery does not occur. Nosocomial infections are one of the urgent problems of modern healthcare (1), since they increase duration and cost of in-patient treatment. In addition, this event is a frequent cause of hospitalizing patients. According to clinical studies, disorders of the bronchopulmonary system account for a quarter of all cardiosurgical postoperative complications. As of recent, there was increase in the number of patients with ischemic heart disease and respective pulmonary pathology (2). According to WHO experts, by 2020 chronic obstructive pulmonary disease (COPD) will be one of the leading causes of morbidity and mortality. Chronic obstructive pulmonary disease increases the risk of death after cardiac surgery by 1.8 fold (3, 4). In bronchial asthma and COPD, the high efficacy of using incentive spirometry with high positive expiratory pressure (PEEP) and oscillatory therapy with controlled positive expiratory pressure (oPEEP) is shown (5). Artificial ventilation of the lungs from an increased fraction of oxygen in the respiratory mixture leads to reduction of the surfactant, decrease in the bactericidal activity of alveolar macrophages, increase in the surface tension of the alveoli, their collapse and the appearance of atelectasis (6). The latter ones are frequently the foci of infection development. In connection with this, artificial lungs ventilation is a risk factor for the development of ventilator-associated pneumonia in the postoperative period in cardiosurgical patients (7). Increased transpulmonary pressure with incentive spirometry allows improvements in collateral ventilation and blood flow due to high positive expiratory pressure (PEEP) (8). This method of opening the unstable alveoli is called recruiting. Incentive spirometry allows a significant increase in the recruiting of alveoli and improves gas exchange. The simultaneous combination of the effects of Conn and Bernoulli in the EzPAP device allows maintaining positive inspiratory pressure, and an increase in the expiratory pressure is due to the resistance created by the device upon exhalation. Thus, high expiratory and positive inspiratory pressure can effectively recruit collapsed lung alveoli. In addition, the mandatory connection of high-speed oxygen to the EzPAP device makes it possible to use it in grave patients who require oxygen insufflation. The device Acapella allows you to combine positive expiratory pressure with oscillatory therapy during exhalation (9). Change in resistance during expiration with a frequency of 12 - 16 Hz causes intrapulmonary percussion, which improves the recruitment of alveoli and the passage of bronchial secretions. This is explained by the fact that pulsating high-speed flow, encountering an obstacle in narrow zones, causes an antiphase flow and moves the secretion in the opposite direction. Intensity of the antiphase flow depends on the elasticity of the bronchioles and the effect of the “bounce”. Previous studies have shown high efficiency of incentive spirometry for improvement of mucociliary clearance and alveolar recruitment in patients; to date, however, direct comparison of the efficiency of different methodological approaches for recovery of respiratory system after cardiosurgical operations has not been carried out. Due to this, the study objective was to study the effectiveness of respiratory parameters recovery after coronary artery bypass graft using different device methods: PEEP-therapy and vibration PEEP-therapy. We studied 45 patients who underwent CABG. The study included the patients without pulmonary pathology and with normal spirometric parameters. In all the examined patients, the initial spirometric indices were the same. Exclusion criteria were pneumothorax after surgery or in medical history, intolerance to increased “breathing”, increased intracranial pressure, hemodynamic instability of the patient, surgical intervention or trauma of the orofacial area. Demographic data, Intra-operative and ICU stay information is shown in Table 1, which did not reveal any significant differences between the groups. All patients underwent сoronary artery bypass surgery with artificial blood circulation. Pharmaco-cold cardioplegia with custodiol was used, which was administered antegradely in the root of aorta. Total body hypothermia was 34°C. Average number of shunts was 2.3 and did not differ between the groups. The duration of the artificial circulation, of aortic compression and the duration of the surgery did not differ between the groups (table). The patients underwent bypass angiography in surgery room after сoronary artery bypass surgery. Patients were divided into 3 groups: Group I (control) - incentive spirometry was not performed after surgery, group II - PEEP-therapy was performed with EzPAP (USA), group III - oPEEP-therapy was performed with Acapella device (USA). For objective evaluation of respiratory function recovery, all patients in post-surgery period underwent spirometry using device SMP-2101-RD (Russia). Study of pulmonary function was performed in accordance with the spirometry standards developed by European Respiratory Society (10). At every stage volumetric and velocity values were studied in patients: Respiratory volume, ventilatory minute volume, respiration rate, inspiratory reserve volume, expiratory reserve volume, vital capacity, forced expiratory volume for the first second, forced vital capacity (FVC), FEV1/VC, forced expiratory vital capacity, peak expiratory flow, mean forced expiratory flow during the 25% of FVC, mean forced expiratory flow during the 50% of FVC and mean forced expiratory flow during the 75% of FVC. Duration of PEEP- and oPEEP- therapy was 50 min/day (5 times of 10 min). Each patient was individually selected for a regimen in which the exhalation pressure was maintained at 10 to 20 cm of water column, and the inhalation/exhalation ratio was 1/3 to 1/4. Control group underwent static respiratory gymnastics using ball. Statistical analysis of data was performed using software Statistica 10. Analysis of the differences between the groups was carried out using a single-factor analysis of variance, followed by an evaluation of differences between groups using the Newman-Keyles and Dunn criteria. The verification of the belonging of the samples to the normal distribution was carried out using the Kolmogorov-Smirnov test. Differences at P < 0.05 were considered as statistically significant. Analysis of the results of the study showed that the second day post-surgery is characterized by a marked decrease in volumetric and velocity respiratory flow values in all the groups studied, in comparison with pre-surgery studies. For example, on the second day post-surgery in groups I, II and III vital capacity decreased by 42%, 35%, 34% (P < 0.01), and forced vital capacity - by 46%, 32%, 35% (P < 0.01) respectively (Figure 1). The revealed changes, apparently, are caused by a postoperative trauma of a thorax and incomplete recovery of respiratory muscles. In addition, these patients showed the decrease in the respiratory flow rate in the bronchi of all levels, which leads to disruption of mucociliary clearance. Figure 1. Dynamics of changes of spirometry parameters in patients in post-operation period after PEEP-therapy (EzPAP, USA) and vibration PEEP-therapy (Acapella, USA). * P < 0.05; ** P < 0.01; *** P < 0.001. For example, in patients of all the studied groups a statistically significant decrease of PFER was detected, AFER 25 - 75, MFER 25, MFER 50, MFER 75. Studied parameters between groups also did not differ. All these changes are the pathogenetic basis for the development of pneumonia in the early postoperative period. Thus, the second day post-surgery is characterized by the same decrease in volume and velocity in respiratory flow rates in all studied groups. The fifth postoperative day is characterized by an improvement in volumetric values in group II, whereas in groups I and III they remained lower compared to the pre-surgery level. For example, in the second group vital capacity and forced vital capacity reached pre-surgery level, while in the group I these parameters decreased by 31% and 34%, and in group III - by 25% and 26% respectively. Similar changes in studied groups are detected when studying PFER, MFER 25, MFER 50. 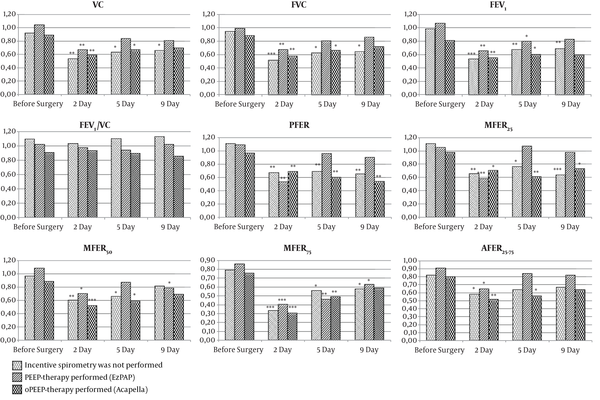 On the ninth day after surgery vital capacity and forced vital capacity in groups II and III reach pre-surgery level, while in group I these values remain decreased by 28% and 32% respectively. Other type of changes was observed when studying velocity parameters of respiratory flow. For example, in group II PFER and AFER25-75 reach the pre-surgery level, while in groups I and III only recovery of AFER25-75 is noted. Thus, at the time of discharge from the hospital, the patients of group II recovered the volumetric and velocity values of the respiratory flow, whereas in group III only volumetric values were restored, and in group I patients there was no recovery. In group II patients, spirometry parameters of respiratory flow were restored more quickly than in group III. So, on the fifth postoperative day, VC and FEV1 in group II were more by 25% and 33%. Similar statistically significant increases of velocity parameters of the flow (PFEV, AFEV25-75, MFEV25, MFEV50) are detected in patients of group II compared to group III. It should be emphasized that obstructive episodes of apnea and hypopnea during sleep after surgery are accompanied by the development of hypoxemia, hemodynamic disorders, which increases the risk of sudden cardiac death. In this connection, the dynamics of night pulse oximetry parameters were studied, which allows us to evaluate episodes of hypoxemia. Analysis of the results of the desaturation index (DI) showed that the second postoperative day is characterized by pronounced sleep breathing disorders at night in all the groups studied. Thus, in groups I, II and III, the DI significantly increases 3.4, 2.6 and 2.9 folds respectively. At the same time in all groups mean SpO2 value during sleep is 90%. On the fifth postoperative day, the same values of nocturnal pulse oximetry remain in group I, whereas in groups II and III the DI decreases by 42% and 34%, respectively, which indicates a faster recovery of the respiratory function with incentive spirometry. On the ninth day after surgery ID in groups II and III reach pre-surgery level, while in the group I these values remain increased by 1.82 fold (P < 0.01). Thus, incentive spirometry allows you to recover at the time of discharge, not only postoperative volumetric and velocity respiratory values, but also to recover from sleep respiratory disorders. Analysis of the study results showed that post-operational pulmonary dysfunction appears in all patients. Thus, in the early postoperative period, a statistically significant decrease in most of the volumetric and velocity values of the respiratory flow was revealed. This is due to the peculiarities of surgical treatment and the physiological and biochemical reaction of the organism. According to the literature, the decrease in respiratory parameters is due to a complex of factors: sternotomy, artificial lungs ventilation, artificial circulation with hypothermia, respiratory depression, pain, prolonged bed rest, etc. (11, 12). It should be emphasized that the preoperative status of the patient (obesity, smoking, comorbidity, etc.) and preparation for surgery also affect the recovery of spirometry parameters. Postoperative pulmonary dysfunction causes an increase in oxygen consumption due to increased work to maintain effective breathing, while hypoxemia causes decrease in oxygen delivery (13). Therefore, in the postoperative period, it is necessary to carry out targeted respiratory therapy. At the same time, there is still no consensus on the use of different methodological approaches for the effective recovery of respiratory values after coronary artery bypass graft. Analysis of the results of the study showed that the often-used clinical values cannot fully reflect the dynamics of postoperative pulmonary dysfunction. For example, no changes of RV, MRV, FEV1/VC were detected in all the stages of the study. According to the literature data atelectasis in the pulmonary tissue are formed mainly during intraoperative and in the early postoperative period (14, 15). Resolving atelectasis in the lungs after cardiac surgery often takes several weeks. All this time there is a decrease in the volume of respiratory values. This agrees with the results of our studies. Thus, at the time of discharge, the main volumetric and velocity parameters were not restored in group I patients. Therefore, this group of patients is in the group of high-risk pneumonia. The use of the EzPAP incentive spirometer (group 2) makes it possible to restore the volumetric and velocity parameters at the time of discharge, whereas the use of the Acapella device (group 3) only restores volumetric parameters. In this regard, after discharge, patients should be advised to continue with vibration therapy with the Acapella device. Probably, the effectiveness of respiratory therapy with EzPAP is due to the fact that it allows to open collapsed alveoli by increasing the transpulmonary pressure and preventing their subsequent collapse (derectuiting) by maintaining positive inspiratory pressure. At the same time the Acapella device only increases transpulmonary pressure, and with inspiration a negative pressure is created, which contributes to the subsequent collapsing of the alveoli. Absence of the component of the alveolar dilation in the case of incentive spirometry with the Acapella device probably makes its use less effective than the EzPAP device. In addition, in our studies in pre- and postoperative periods, a bronchodilator test was performed. Improvement of bronchial patency on the background of bronchodilators in groups I, II and III was not revealed. This indicates that the changes were predominantly restrictive. Since the severity of the restriction has a direct correlation with postoperative lethality, it can be assumed that the faster recovery of volumetric spirometry parameters and sleep respiratory dysfunction by the EzPAP incentive spirometer contributes not only to the prevention of postoperative pulmonary dysfunction, but also to a reduction in mortality. Application of incentive spirometry also allows the recovery of post-surgical sleep breathing disorders quicker and reduce the number of hypoxemia episodes during sleep. Episodes of SpO2 decrease and significant increase in desaturation index may cause the development of acute coronary syndrome in post-surgical period. Our studies showed that use of EzPAP and Acapella is equally effective in post-surgical period. Moreover, desaturation index reaches pre-surgical level at the time of discharge, indicating the effective recovery of sleep breathing disorders. Carrying out PEEP therapy after coronary aorta bypass surgery with EzPAP incentive spirometer allows to restore volumetric and velocity respiratory values at the moment of patient discharge from the hospital, whereas after vibrational PEEP therapy the Acapella device restores only volumetric values, and in the patients of the control group, recovery does not occur. Ethical Considerations: The work was performed in accordance with ethical guidelines for research in animal science. 1. Mocanu V, Buth KJ, Johnston LB, Davis I, Hirsch GM, Legare JF. The importance of continued quality improvement efforts in monitoring hospital-acquired infection rates: A cardiac surgery experience. Ann Thorac Surg. 2015;99(6):2061-9. doi: 10.1016/j.athoracsur.2014.12.075. [PubMed: 25795297]. 2. Campo G, Pavasini R, Malagu M, Mascetti S, Biscaglia S, Ceconi C, et al. Chronic obstructive pulmonary disease and ischemic heart disease comorbidity: Overview of mechanisms and clinical management. Cardiovasc Drugs Ther. 2015;29(2):147-57. doi: 10.1007/s10557-014-6569-y. [PubMed: 25645653]. 3. Galie N, Humbert M, Vachiery JL, Gibbs S, Lang I, Torbicki A, et al. 2015 ESC/ERS Guidelines for the diagnosis and treatment of pulmonary hypertension: The joint task force for the diagnosis and treatment of pulmonary hypertension of the European Society of Cardiology (ESC) and the European Respiratory Society (ERS): Endorsed by: Association for European Paediatric and Congenital Cardiology (AEPC), International Society for Heart and Lung Transplantation (ISHLT). Eur Heart J. 2016;37(1):67-119. doi: 10.1093/eurheartj/ehv317. [PubMed: 26320113]. 4. Roversi S, Fabbri LM, Sin DD, Hawkins NM, Agusti A. Chronic obstructive pulmonary disease and cardiac diseases. An urgent need for integrated care. Am J Respir Crit Care Med. 2016;194(11):1319-36. doi: 10.1164/rccm.201604-0690SO. [PubMed: 27589227]. 5. Nicolini A, Mascardi V, Grecchi B, Ferrari-Bravo M, Banfi P, Barlascini C. Comparison of effectiveness of temporary positive expiratory pressure versus oscillatory positive expiratory pressure in severe COPD patients. Clin Respir J. 2018;12(3):1274-82. doi: 10.1111/crj.12661. [PubMed: 28665556]. 6. Brown B, Roberts J. Principles of artificial ventilation. Anaesthesia Intens Care Med. 2016;17(3):120-32. doi: 10.1016/j.mpaic.2016.01.008. 7. Charles MP, Kali A, Easow JM, Joseph NM, Ravishankar M, Srinivasan S, et al. Ventilator-associated pneumonia. Australas Med J. 2014;7(8):334-44. doi: 10.4066/AMJ.2014.2105. [PubMed: 25279009]. [PubMed Central: PMC4157153]. 8. Mowery NT. Ventilator strategies for chronic obstructive pulmonary disease and acute respiratory distress syndrome. Surg Clin North Am. 2017;97(6):1381-97. doi: 10.1016/j.suc.2017.07.006. [PubMed: 29132514]. 9. Cho YJ, Ryu H, Lee J, Park IK, Kim YT, Lee YH, et al. A randomised controlled trial comparing incentive spirometry with the Acapella(R) device for physiotherapy after thoracoscopic lung resection surgery. Anaesthesia. 2014;69(8):891-8. doi: 10.1111/anae.12750. [PubMed: 24845198]. 10. Miller MR, Hankinson J, Brusasco V, Burgos F, Casaburi R, Coates A, et al. Standardisation of spirometry. Eur Respir J. 2005;26(2):319-38. doi: 10.1183/09031936.05.00034805. [PubMed: 16055882]. 11. Pawar M, Mehta Y, Khurana P, Chaudhary A, Kulkarni V, Trehan N. Ventilator-associated pneumonia: Incidence, risk factors, outcome, and microbiology. J Cardiothorac Vasc Anesth. 2003;17(1):22-8. doi: 10.1053/jcan.2003.4. [PubMed: 12635056]. 12. Rotstein C, Evans G, Born A, Grossman R, Light RB, Magder S, et al. Clinical practice guidelines for hospital-acquired pneumonia and ventilator-associated pneumonia in adults. Can J Infect Dis Med Microbiol. 2008;19(1):19-53. doi: 10.1155/2008/593289. [PubMed: 19145262]. [PubMed Central: PMC2610276]. 13. Wynne R, Botti M. Postoperative pulmonary dysfunction in adults after cardiac surgery with cardiopulmonary bypass: Clinical significance and implications for practice. Am J Crit Care. 2004;13(5):384-93. [PubMed: 15470854]. 14. Canet J, Gallart L. Postoperative respiratory failure: Pathogenesis, prediction, and prevention. Curr Opin Crit Care. 2014;20(1):56-62. doi: 10.1097/MCC.0000000000000045. [PubMed: 24240985]. 15. Tusman G, Bohm SH, Warner DO, Sprung J. Atelectasis and perioperative pulmonary complications in high-risk patients. Curr Opin Anaesthesiol. 2012;25(1):1-10. doi: 10.1097/ACO.0b013e32834dd1eb. [PubMed: 22113182].